During this tour you will visit the most interesting places and see the splendid architectural masterpieces of St.Petesburg: the Fine Arts Square and the Russian Museum, the beautiful Church of Resurrection on Spilled Blood, the Field of Mars, the Alexandriinsky Drama Theater, the Smolny Cathedral, classical buildings of Senate & Synod , the Bronze Horseman, the Palace Square, the Cruiser Aurora and many more. 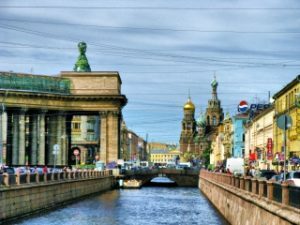 You will have several stops on the route, to make photos of the splendid panoramas of the magnificient Saint-Petersburg. Besides the sightseeing, you will visit Peter-and-Paul Fortress, the birthplace of the city. It is the very first stone building constructed here by the order of Peter the Great. Today the fortress is one of St. Petersburg’s major tourist attractions and has become the emblem of the city. Tour includes an entry to the Peter and Paul Cathedral, that is containing the tombs of many Russian Tzars – Peter the Great, Catherine the Great, Nicholas II and others. Tour is not available on Wednesdays.